With the Whisper White panel laid vertically, stamp the blossom in Tempting Turquoise onto one of the lower corners, then next to it. Reink the stamp and stamp in the other corner, turn the card and stamp again. Repeat until you've created a frame. Attach panel to folded base card. 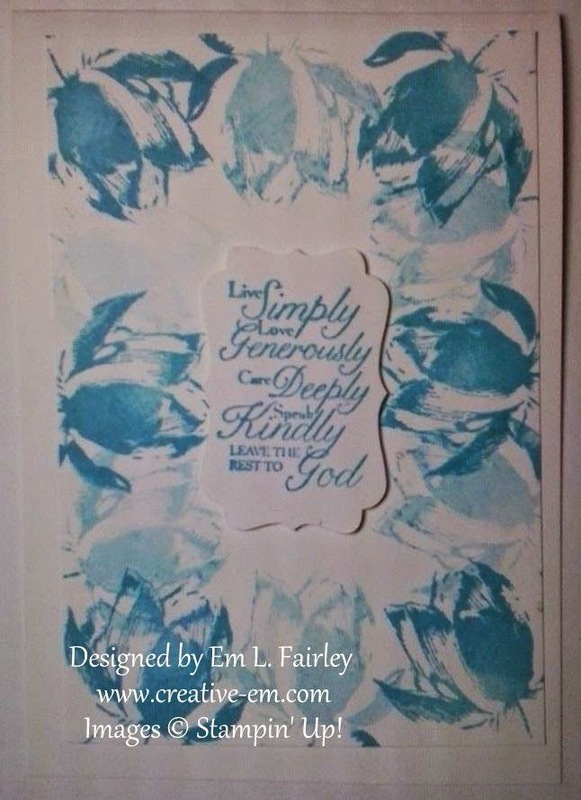 Stamp the sentiment in Tempting Turquoise, punch out with the Decorative Label punch and attach to panel with Stampin' Dimensionals. I love the look and will definitely be trying it in other colors soon! I'll be back tomorrow with my fourth very different Lotus Blossom creation, so I hope you'll join me then. What a pretty card!! I really like the stamped off flowers and the color you used. Thanks so much for sharing with us at Word Art Wednesday. Hi Em, a gorgeous card, love those stamps and the beautiful colours. great card. The blossom background is beautiful! Lovely creation, as usual! Thanks for dropping this off by our house here at 613 Avenue Create! We love seeing you in the neighborhood.